Blinds Archives - Home Improvement Ideas From Let Me Build It! Archive - Home Improvement Ideas From Let Me Build It! 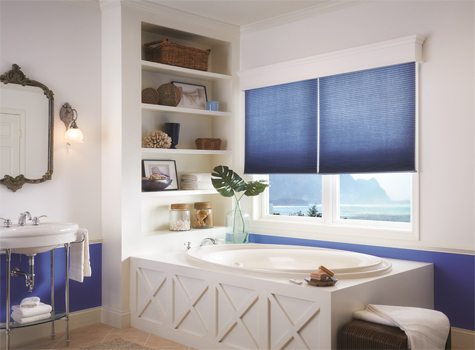 Cellular shades can add warmth, style and privacy to any bathroom. The top-down-bottom-up option is a fantastic way to let light into a bathroom, no matter how small it may be, but still maintain privacy when needed. Shades can be ordered in almost any colour in order to complement the existing fixtures you have, or you can find fresh new fixtures at UK Bathrooms. Versatile, practical and chic, vertical blinds are an excellent choice for every room in your home. Extremely useful, vertical window blinds come in a wide variety of colours, materials and patterns. Matching any décor is a breeze. Features include swivelling panels to allow in as much or as little ambient light as you like. Draws can be placed on either side, or the blinds can be fashioned so that they open down the middle, making them extremely practical. With customisable sizes available to fit any window opening, there are vertical blinds for every room in your home. Vertical blinds are especially useful in family rooms. With a classic, timeless look, they match any décor, from casual to elegant. The clean lines and minimalistic appearance make them an excellent match for a contemporary room, and their practicality makes them perfect for enhancing a casual look. Rich textures and colours also make vertical blinds a good choice for a sophisticated room.The family room can be enhanced with the addition of vertical blinds. The ability to make small changes in the amount of ambient light let into the room makes them a practical choice. The use of blackout liners adds insulation, keeping the room warmer in winter and cooler in summer, as well as enhancing light control and privacy. Blackout liners work well with vertical blinds in the media room, helping to further reduce glare. Vertical blinds in the media room help create an optimal viewing experience. With blackout liners, the room can be completely darkened. Vertical blinds are the perfect solution for the conservatory or for other large window spaces or sliding glass doors. Customisable sizes make them a practical choice, and the vertical design makes them ideal for sliding doors. Vertical blinds are an excellent choice for every room in your home. Homeowners choosing bathroom blinds will need to consider two major points: practicality and privacy. Privacy is ensured with window blinds, and the addition of blackout liners provides total privacy. Moisture resistance and ease of care are two important practical qualities to look for in bathroom blinds. Several excellent choices are available, offering homeowners versatile, elegant solutions to their window-covering needs. Heavy fabric curtains offer privacy, but in the humid atmosphere of a bathroom can collect dust and encourage the growth of mould. Window blinds are a better choice, coming in a variety of materials, colours and patterns to suit every taste. Bamboo is gaining in popularity as a material for bathroom blinds. It is moisture-resistant, easy to maintain and adds a touch of casual elegance to the room. Cleaning bamboo blinds is as easy as wiping them with a soft, damp cloth every so often to remove any accumulated dust. Likewise, PVC and aluminium make excellent choices for bathroom blinds, coming in a variety of colours and patterns.Roller blinds are an affordable choice for a bathroom, offering optimum privacy and low-maintenance care. Blackout liners can be added to nearly any style blind to offer the most privacy and light control. Additionally, adding liners to blinds helps increase their insulating properties, keeping rooms comfortably cool in summer and warmer in winter. Vertical blinds are a good choice for bathrooms with unusually tall windows. Customised bathroom blinds make it possible to fit blinds to any size or shape of window opening. Read the measurement instructions, or have a professional do the measuring for you, to ensure the best fit with customised blinds. Classic Venetian blinds are another good choice for bathroom blinds. They can be made of PVC, metal or bamboo, offering a wide variety of styles and colours to match any décor. No matter your family’s preference, budget or colour choice, there are bathroom blinds perfect for your home. Most people add on a conservatory in the hope of gaining extra living space. However, with the bright, open space comes heat in summer and cold in winter. The lovely grand windows that bring in the light also allow too much energy and heat to escape. The extra space can provide a great place for entertaining, if the temperature and light conditions can be controlled. Blinds are the solution most homeowners need to make their conservatory into a comfortable living space that can be used year-round. Tall windows can be difficult to fit. Custom conservatory blinds are an excellent solution for keeping your living space comfortable. Vertical blinds fit tall spaces well, and are adjustable, allowing you to let in as much or as little light as you like. The types of blinds are nearly endless. Fabric, bamboo, aluminium and PVC are all excellent choices, depending on your home’s décor, coming in a wide range of colours and styles. Roman blinds add a casual elegance that goes well with a less-formal family style home. Their simple, fold-up design creates a subtle sense of luxurious style. Choosing natural, easy to care for materials like bamboo makes looking after for the blinds easy. Bamboo blinds can be cleaned with a damp cloth and allowed to air-dry. PVC and aluminium blinds can be treated the same way. For families who prefer a bit more privacy, blackout blinds are a good choice. Blackout blinds have a heavy lining to block light, heat and cold, creating a completely controllable, comfortable environment that makes your conservatory an enjoyable living space for your family. The graceful, clean lines of blackout roller blinds make them the perfect unobtrusive accessory for your conservatory. Choose from the wide variety of materials available to match your home’s décor and your family’s lifestyle. During the Georgian period, most window coverings were interior or exterior shutters. Constructed in wood, they were typically fastened with a wooden bar placed across the two closed shutters, held in place by wooden hooks. In mid the 19th century, the Venetian blind came into common use in office building. They were made from lightweight, wooden horizontal slats, joined together by a ladder of flat strips of cloth. Englishman Gowin Knight took out a patent on the design in 1760, and a year later, a church in Philadelphia had slatted blinds on its windows. Reputed to have originated in Persia, Venetian blinds are also known as Persian blinds, and in France, where they were used much earlier than in England and America, they were known as “Persiennes” due to their reputed Persian origins. Before this, most Victorian blinds were roller blinds, home made from cloth.More modern times From the late 19th century until the mid 20th century, offices used Venetian blinds to control light and air flow in the workplace. New York’s Radio City Building used Venetian blinds in the 1930s, and a massive order for Venetian blinds was placed for all of the windows in the Empire State Building. In the 1940s, a method of producing narrow aluminium slats for Venetian blinds was developed in America, and they were made available for the mass market. An economical way of covering windows was continued with the inception of mini-blinds, in various versions, materials and sizes. Very popular in the 1970s and 1980s, mini blinds are Venetian blinds that use a narrower slat, constructed in lightweight aluminium. 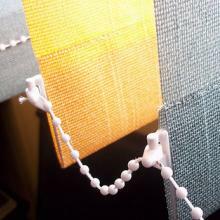 Since then, blinds have developed with many styles and in very many fabrics. Which Curtains and Blinds Offer the Best Insulation? Windows can be a source of heat loss in the winter. Choosing the right curtains and blinds can help to insulate the home, reducing heat loss and energy bills. Although all curtains and blinds provide a degree of insulation, some are more effective than others.Heavy curtains and those with thermal linings work best at preventing heat loss. Some curtains feature a third layer of interlining which provides a higher level of insulation. Curtains can also be combined with a simple window blind such as a roller blind. Roller blinds are very discreet and can be hidden within a window recess, providing further insulation when rolled down behind drawn curtains.Many blinds, particularly Roman blinds and roller blinds, are available with a thermal lining and are often cheaper to buy than curtains. Thermally-lined blinds are effective at preventing heat loss and, like curtains, are available in a range of styles and colours, allowing you to save money on energy bills with decorative flair. Blinds are popular for covering windows to obtain privacy, to keep heat in or out and to add a stylish look to a home. However, they are not just fitted within the home environment. Many offices also use blinds at the windows, and this article offers information about commercial blinds. When choosing blinds for an office environment you need to consider it from both a practical perspective and also from an aesthetic perspective. For example, an office that often has a lot of sunlight coming in through the windows needs to consider how light intrusion can be eliminated. Versatile BlindsVertical and Venetian blinds are often thought of as the most versatile type of blinds, and they are particularly popular in offices. This is because they are easy to use and can be operated simply with a pull chord or chain. However, they can also be adjusted to allow differing amounts of light into the room. Vertical blinds consist of panels that stand vertically and can either separate in the middle to stack either side, or they can all slide to one side. Venetian blinds are comprised of wooden slats that lay horizontally. These are then raised and lowered, and can also be adjusted to allow differing amounts of light into the room. The LookWhen choosing blinds for your office space you will need to consider the overall look you wish to end up with. If your office space is creative and colourful you should choose something to match this. However, you could also opt for simple and subdued pastel colours. Alternatively, you can choose natural wooden blinds. The possibilities are endless, and you should consider what the office already looks like, and the look you wish to end up with following the installation of the blinds. VELUX blinds are designed for roof windows so they do not tend to get as dirty as other blinds around the house but they will require cleaning at some point. The following tips should help you with the cleaning process. VELUX venetian blinds which use aluminium slats require only simple cleaning. Wipe them with a damp cloth or use a feather duster to remove dust which will gather over time. Do not use cleaning chemicals as it is possible that this might damage the blinds.VELUX blackout blinds should be suitable for being wiped clean which means that any dust or dirt can simply be wiped away with a cloth without worrying about damaging the blinds. Any stubborn dirt can be removed using a warm, damp cloth.Any of the other types of VELUX blinds should be cleaned with a dry cloth or feather duster. A damp cloth is not recommended as this might cause damage to your blinds. Fashions in curtains and blinds have come and gone over the years, from heavy pelmets to fancy swags and tassels, from ruched silk to metal venetian blinds, and from headers with French pleats to eyelets or tab tops. A glance at any book about interior design and soft furnishings will give a fascinating insight into how these different styles have developed through the ages.Ever since humans started building settled communities and gave up the hunter gatherer lifestyle, they have taken pride in their homes. Windows were primarily a way to let out smoke, and often had wood or fabric coverings to keep out the wind and rain. Solid wooden window shutters were the normal window covering for most European homes until glass became more affordable. It wasn’t until the 16th century that glazed windows became widely used, and this is when the fashion for elaborate fabric curtains and poles as an important element of interior decoration really came into its own. In poorer homes, a curtain was a single, fixed piece of fabric. Fashions for more elaborate designs and rich fabrics such as velvet, hanging in pairs, started in Italy and France before being adopted in England.Internal wooden shutters became more sophisticated, and fabric curtains were influenced by the opulent style of the French King Louis XIV. During the 17th and 18th century the fashions for decorative curtains, ruched fabric blinds and pelmets to hide curtain rods, curtain rings and pulley and cord mechanisms were born. Decorative styles then came thick and fast, from Rococo to Neo-Classicism to Empire and Regency, and almost every type of curtains and blinds we use today has its origins in history, no matter how modern we think it looks. Roman Blinds and Roller Blinds – What is the Difference? If you are wondering what the differences are between Roman blinds and roller blinds, then here is a definitive explanation.There are many variations of these two styles of blinds, but the difference is in the method by which they are drawn up. Both roller blinds and Roman blinds hang above the window and are drawn down to block out the light. Roller blinds are always made of a flat piece of strengthened fabric which is rolled around a pole, usually made of metal. When pulled down, they unravel, and then roll back up again on a spring system, as required.Roman blinds on the other hand are drawn up using a pulley system of cord or string which gathers them up in folds. Roman blinds are made of fabric and have a fairly simple construction. They have one vertical line of cord attached on each side which draws them upwards. The fabric is strengthened with a series of horizontal dowel rods so that it folds neatly into flat horizontal folds as it goes up.There are several variations on Roman blinds, using looser fabric and without having horizontal rods. These are called Austrian and Festoon blinds and they have a more gathered or ‘ruched’ and fussy effect, rather than lying flat against the window. They often have several vertical lines of cord attached to the fabric to gather it up into ‘scoops’ as it rises.Whilst roller blinds are best bought ready-made, you can make Roman blinds yourself, with the help of instructions. Roman blinds can be made of almost any fabric and are usually lined. The horizontal dowel rods can be either hidden in pockets or tucks within the fabric, or glued onto the back. Simple metal grommets are punched into the fabric to make holes for the cord.